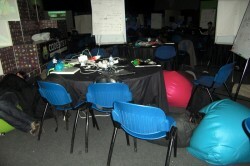 Once again, I went to Codebits. Every year I write how wonderful this event is. 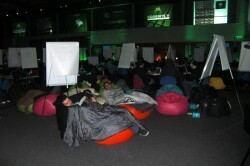 As described on the Codebits site we had: 3 days. 24 hours a day. 800 attendees. Talks. Workshops. Lots of food and beverages. 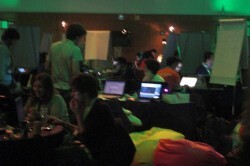 48 hour programming/hacking competition. Quiz Show. Presentation Karaoke. Security Competition. Lots of gaming consoles. LEGO. More food. More beverages. More coding. Sleeping areas. More fun. An unforgettable experience. On Thursday morning, you walk in as a normal person, on Saturday evening, you crawl out – on your knees, entirely finished, but with that warm feeling that you have achieved something and have been part of a huge community that hacks for fun and work. What is new this year: more people and more wacky ideas for fun ie badges etc. 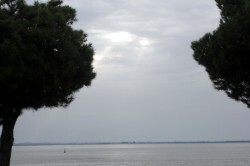 There is always something going on. Unfortunately being stuck behind a huge table of books, I can see only a little part of it. Some good presentations since my table was near Stage A where Chris Anderson, co-author of CouchDB: The Definitive Guide , gave the following talk: Couchbase Sync can save the world! The effects of the Nuclear Tacos – apparently they are awful. After eating one, the first 10 mn, you think you are going to die, then you feel awful because you know you are not going to die. 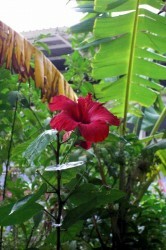 As the queue to the restaurant was near me, I have seen some white, red and sickly faces – not a pleasant sight. 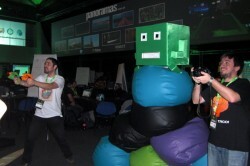 See the Nuclear Tacos Sensor Helmet Gameshow @Codebits 2011 developed by altlab Lisbon’s Hackerspace as part of the hacking competition. I was given a pleasant drink – I believe whoever made it played with the molecules of the ingredients – no killing field this time. Conga – wild music would start and the staff would do a Conga in the main room. Skateboards – I believe there was a kind of a contest for daredevil runs. Even saw a plastic air gun toy. I am glad SAPO, organize these types of recreation to keep everybody going – wake up calls that are very needed – see pictures. 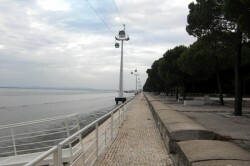 I forgot to mention how much I like Lisbon and the joy of the walk from the hotel to the venue particularly on Saturday morning – it is fresh, calm and beautiful. 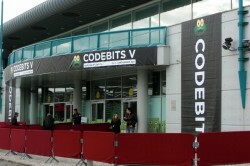 I hope one of the organizers will be able to tell you more about Codebits V in the very near future.